Shah is also considering his exit, but he has not yet settled on an exact date. Neither Sanders nor Shah responded to repeated requests for comment before this story was published. When reached Wednesday evening, both declined to comment on the record, and Sanders tweeted that she is "honored to work for @POTUS." Numerous staffers have left the White House over the last several months, some voluntarily and others having been forced out. 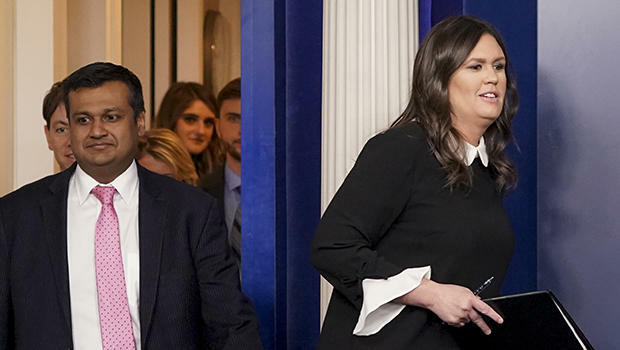 Those departures include Hicks; Jared Kushner's top communications aide, Josh Raffel; homeland security adviser Tom Bossert; National Security Council spokesman Michael Anton; Trump personal aide John McEntee; director of White House message strategy Cliff Simms; communications aide Steven Cheung; congressional communications director Kaelan Dorr; assistant press secretary Natalie Strom; and deputy director of media affairs Tyler Ross. Over the course of the Trump administration, the White House has consolidated its workforce, eliminating jobs and assigning multiple portfolios of responsibility to individual staffers. Some positions have never been filled. Despite the smaller number of positions, the record-setting turnover rate has not slowed. Less than halfway through Mr. Trump's term, the turnover rate stands at 51 percent, according to the Brookings Institution. Turnover during Mr. Trump's first year in office was 34 percent -- nearly four times higher than turnover during the first year of the Obama administration. "There will be even more people leaving the White House sooner rather than later, laid off or just leaving out of exhaustion. And it is going to be harder to find good people to replace them," a source close to the administration told CBS News. "I do think they're going to have a harder time getting the second wave of people in than the first, because those people were loyalists, and [new] folks will have to be recruited and encouraged and then survive the vetting process. In addition to all of that, the president prefers to have a small communications staff." Kathryn Dunn Tenpas, a senior fellow at the Brookings Institution who has studied turnover dating back to the Reagan administration, published a report that tracks senior-level departures of the Trump administration compared to previous presidencies. She told CBS News that the sheer number of top-level exits indicates a troubling inconsistency in the ranks of those who see the president on a regular basis. If the White House were a private-sector business, Tenpas said the level of turnover among senior staffers would result in the "stock and shareholders ... going nuts." The White House has been plagued by leaks that have infuriated top White House officials, including one about communications aide Kelly Sadler making an insulting joke about Arizona Sen. John McCain, who is suffering from brain cancer. The incident spawned an Oval Office meeting with Sadler and senior communications aide Mercedes Schlapp that ended in recriminations and expletives over leaking. Many staffers have described the White House as a dysfunctional and toxic place to work. Sadler, too, recently left the White House. "So many people haven't even stayed in these jobs to master the learning curve," Tenpas told CBS News. "You don't hear much about the importance of expertise. This is a White House that doesn't seem to value that or understand the consequences of it. It's kind of one of those things where we may not know the vulnerability of lacking expertise unless there is a crisis -- or a crisis that may have been averted had a person been in the room." Sources close to the administration fear that while Mr. Trump has been able to bring in a handful of senior, high-profile replacements like national security adviser John Bolton, National Economic Council director Larry Kudlow and Secretary of State Mike Pompeo, there aren't many more qualified people willing to sign up for such an unpredictable high-wire job. "Nobody wants to come in," a source close to the administration said. "So they've gone through two rounds and now they're at third tier of people who are just lucking out -- battlefield promotion ends up promoting people who aren't qualified for the position."